Well… sort of! The official day that we celebrate the Feast of the Annunciation is March 25, which is exactly nine months before Christmas. However! Since March 25 was Palm Sunday this year, and since the Feast of the Annunciation is super important, the Church moves the date later, when the day can be focused on properly! So, this year the Church celebrates it today. And it is a big feast day! When it falls during Lent, the Church takes a break from Lent and celebrates it — so it’s like another Fat Tuesday in the middle of Lent where you can take a break from your Lenten fasts and just indulge in a piece of cake — or three — and just live it up like a king or queen until the next Lenten day comes. Why? Because that moment where Mary assents and gives her Fiat is one of the most beautiful moments of all time! You can just imagine Heaven and Earth holding its breath and, as soon as she assents, there is a big sigh of relief, followed by a huge party, because Christ has been conceived! Hooray! And, if you can’t imagine it, here’s an artwork to help you imagine it! The Annunciation, by Lucenti de Correggio, c. 1610s. State Hermitage Museum, St. Petersburg, Russia. When I first saw this artwork, I was stunned. 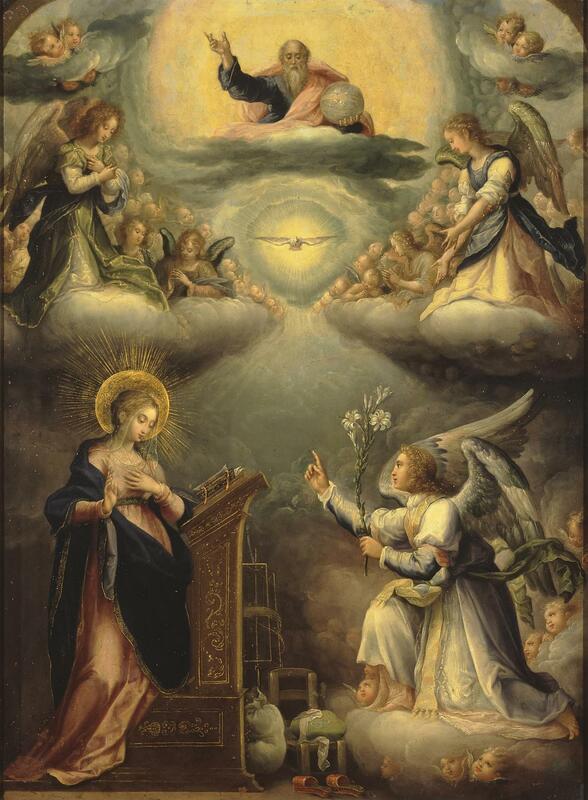 It looked as if Heaven was opening up, with everybody peeking in to observe this amazing scene of Mary’s fiat, with the Holy Spirit descending upon her and giving her the gift of Christ. Of course, it being the Easter season, I couldn’t help but think that this image, with Mary kneeling and the Holy Spirit descending on her, is a familiar one. After all, in a little over a month, we will celebrate Pentecost, in which we celebrate the Holy Spirit descending upon all of us. And in the icons and artwork of the Pentecost, there are many images where Mary is seen once more kneeling and receiving the Holy Spirit — though, this time she is surrounded by the disciples! And thus, she has experienced the gift of Christ by the Holy Spirit in two different ways! But for now, we celebrate the first time the Holy Spirit descends upon her and marvel on her sheer trust in God. And we also marvel that, in this one little moment, the course of the world changed forever. True story: A couple of days before I was ready to publish my book, The Joyful Mysteries, I found this artwork and basically rearranged everything, just so I could fit this magnificent artwork in. For a peek inside, plus to find out how to buy it, click here.